We specialize in laser dentistry. Heat, vibration, and pressure are the primary causes of pain associated with the use of the traditional dental drill. Since cutting teeth and gums with the WaterLase does not generate much heat, vibration or pressure, in certain clinical cases, dental procedures can be performed with fewer to no local anesthesia shots. Using the Waterlase for gum procedures reduces bleeding, post-operative pain, swelling. It’s just a way to get your dentistry done more comfortably. We are certified and lincense in intravenous (IV) sedation. The most obvious advantage of conscious IV anesthesia is to allow the patient to undergo multiple dental procedures, all while been sedated. Our facility is certified by the state of Florida to provide general anesthesia dentistry. Call today for information about how to sleep through your next dental appointment. In general, these sedated patients do not want to remember anything when going to the dentist. At our practice, we help patients undergo years’ worth of dental work all while been sedated, in as little as one visit. When we met our patients in real life, we ask questions to get to know them better. We listen to their past dental work, previous dental experience, and beliefs. We try to unearth their dental and life story, and to tell our own as clinicians. The end goal is find out if we can bring these patients back to good oral health. In this process of knowing each other during our one hour consultation we tap into the underlying reason patients have dental issues and why they have decided to come to see us– to get to be the very best version of themselves; a version they have always had within them that got lost along the way. Laser and sedation specialist Doctor Max Arocha DMD in Plantation with Waterlase is able to remove decay tooth enamel (the hardest substance in the body), bone and gum tissue precisely while leaving surrounding areas unaffected. This conserves and allows you to keep more of the healthy tooth structure. Heat, vibration, and pressure are the primary causes of dental pain associated with the use of the traditional dental drill. Since cutting both hard and soft tissues (teeth and gums) with the Waterlase does not generate heat, vibration or pressure, many dental procedures can be performed with fewer shots, less need for anesthesia, less use of the drill and fewer numb lips! Additionally, using the Waterlase® for gum procedures reduces bleeding, post-operative pain, swelling and the need for pain medication in many cases. High-speed drills can cause hairline cracks and fractures in the teeth that eventually lead to future dental problems. Waterlase® reduces damage to healthy portions of the tooth and minimizes trauma. Waterlase® cavity preparations can increase the bond strength of tooth-colored restoration resulting in longer lasting fillings. Less Bleeding & Swelling Due to its conservative, gentle cutting action and coagulating capabilities, the Waterlase® performs much soft tissue (gum) procedures with little or no bleeding and less post-op swelling. Fewer Dental Visits Since you often do not need shots or anesthesia, a Waterlase® dentist can perform cavity preps in all areas of the mouth in just one visit. This technology also gives trained Waterlase® dentists the ability to perform many procedures that were previously referred to specialists. The Waterlase is extremely versatile. It can be used for a wide range of hard and soft tissue procedures. From decay removal, cavity preparation, root canals, smile design, gum, and bone surgical procedures and many others. 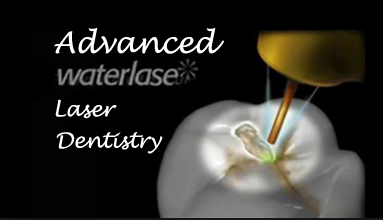 Waterlase® laser system combines laser energy and a spray of water in a patented technology called Hydrophotonics™ to perform minimal invasive wide range of dental procedures on teeth, gum and bone. It creates special, highly concentrated light energy, and sends it through an optical fiber to its handpiece. Then the handpiece is use to aim the laser energy at precisely the areas to be treated. This laser systems combine the laser energy with a gentle spray of water.